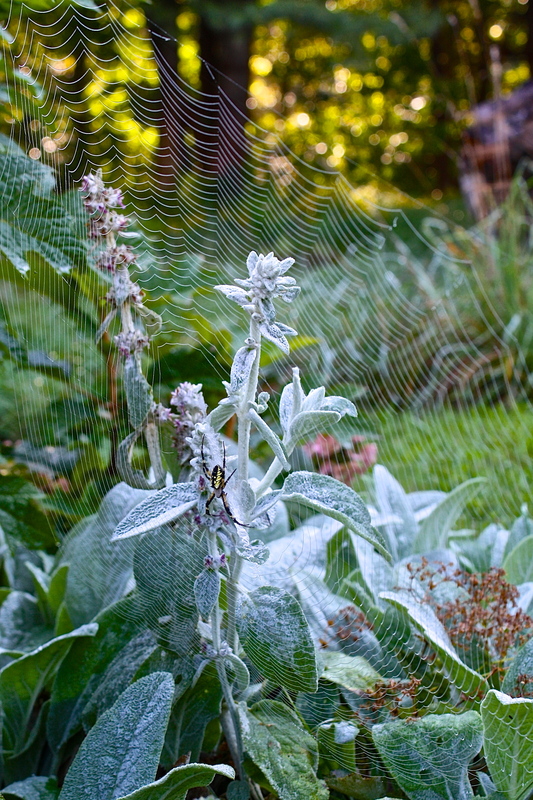 This entry was posted in Country Gardening, My Photos and tagged arachnid, Argiope aurantia, beneficial insect, Garden, lamb's ears, nature photography, orbweaver, photography, Silent Sunday, Stachys byzantina, Yellow Garden Spider. Bookmark the permalink. Oh wow, Eliza. Very cool. That may be my favorite so far. The way you got the web and the spider and the plant. The design is exquisite. It would be fun to play with cropping and create different abstract designs (keeping the original of course!). I love this. Beautiful Eliza! I suppose the visceral hatred many humans have of spiders is understandable since some can harm us but it seems a shame since so many are beneficial. Thank you, Frank. Their service to the planet is beyond estimation, both as prey and predator! What a stunning photo. Just love it. My favourite spider of all. They are magnificent. Great photo. Thank you, Debra, they are pretty spectacular. Don’t you love their ‘zipper’ signature? that Web is STUNNING! Such perfection. What a great shot with the web! The cobwebs are starting to look great at this time of year. Can’t wait for mornings glistening with dew! Thank you, Val. Webs are normally almost invisible, (inadvertently, I walk through many on my morning rounds) but dew makes them stand out boldly, each drop a precious jewel. I admire those tiny artists! What perfect framing, with the web interposed between spider & lamb’s ears. A gorgeous shot! And what a coincidence… last evening I read of a HUGE communal spider web down in Texas. I’d never heard of such a thing. Thanks for your kind praise, M! I usually have at least one around my gardens every year. I love them! Oh, how beautiful – scary – but fascinatingly beautiful! I had one of these in my flowers in Maine I fondly referred to as Frankenstein because of that jagged little web weave. I do not have these in my garden here in NY but I also remember them from my childhood in WI – running through the fields. I was terrified I would run into one of their webs which they would weave between the tall blades of grass. They are big, but quite docile. I think they would rather run away than bite. 😉 I love spiders like I do bees and wasps. They do us a great service, but I leave them alone to do their work! Ha ha – me, too. I left the hornet’s nest in my greenhouse – no heart to kill them. The greenhouse is full of weeds. I look forward to a frost so I can go in there and clean it out. I’m sure the hornet’s did great work in the garden and I believe that once they nest in one place they don’t again? Or was that paper wasps? Let’s hope next year they move. Thank you, Liv! Hope you’re doing well. Hi Eliza, one of the commenters above suggested you ‘play’ with this image, but I think it’s just beautiful and awe-filling exactly as it is. It’s one my favourite photos of yours :). PS Re your post about SPAM, I haven’t checked my SPAM folders but I will next time I’m going through my blog, just in case. Amazing …beautiful! I have one of these plants in my perennial garden here in WI…but I do not know its’ name. I see an interesting plant, and I plant it…LOL…I am sure you know the name, Eliza! What a wonderful photograph! Spiders are amazing! Though I do not like them crawling on my face. I was sleeping in my room in Kiriko, Kenya, many years ago, and I felt something crawling on me. I lit the candle (no electricity except for 2 hours per day) and saw this gigantic spider scurrying away…I never did find it…but I had a bite on my face an inch in circumference for many months and still have a scar to this day. What memories your photograph brought back to me!